(a) Using a CLG of the FOREX, explain the impact of the capital inflow on the international value of the currency of Country X. The Country of X is table and therefore a safer place to invest,, so citizens of other countries invest in Country X. 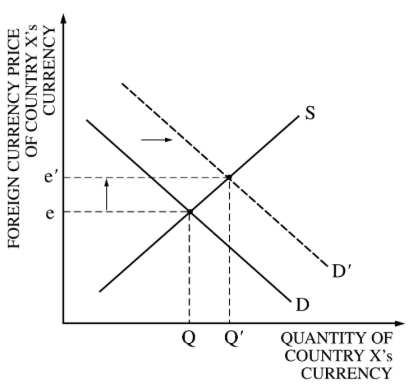 The demand for Country X's currency increases driving up the value of country X's currency. 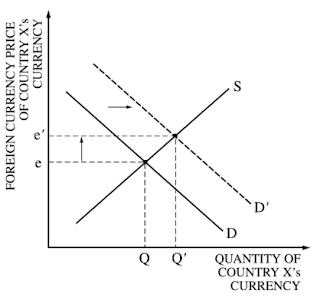 (b) For Country X, explain the effect of the change in the international value of its currency on each of the following. 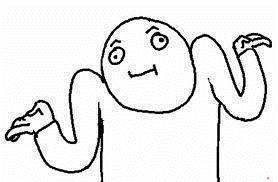 If country X's currency appreciates then foreigners would have to give up more of their currency to buy country X's goods. In essence, Country X's goods have become relatively more expensive than other countries,, and therefore exports decrease. Study or don't, there is no try.